Longlisted for the 2014 Samuel Johnson Prize for Non-Fiction 'A thrilling and complex book, enlarges our view of Homer ...There's something that hits the mark on every page' Claire Tomalin, Books of the Year, New Statesman Where does Homer come from? And why does Homer matter? His epic poems of war and suffering can still speak to us of the role of destiny in life, of cruelty, of humanity and its frailty, but why they do is a mystery. How can we be so intimate with something so distant? 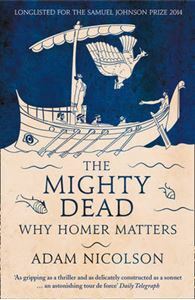 'The Mighty Dead' is a magical journey of discovery across wide stretches of the past, sewn together by some of the oldest stories we have - the great ancient poems of Homer and their metaphors of life and trouble. In this provocative and enthralling book, Adam Nicolson explains why Homer still matters and how these vital, epic verses - with their focus on the eternal questions about the individual versus the community, honour and service, love and war - tell us how we became who we are.